The Giveaway will end this Friday, January 6th! Best of luck to you! Remember, you can enter the contest one time for following all 11 blogs, one time for following all 11 stores and one time for following all 11 Facebook pages! Post your comments below. HAPPY NEW YEAR!!!! What a great giveaway! I follow all 11 blogs. Thank you for the chance to win those fabulous units! I follow all 11 blogs! I follow all 11 TPT stores! Happy New Year! I follow all 11 blogs. I follow all 11 blogs! I follow all 11 TPT stores! I follow all 11 Facebook pages! I follow all TPT stores and LOVE everything in them!!! Happy New Year!!! What a fabulous giveaway!! I follow all 11 stores too!! And thanks for organizing the links! There were 2 that I haven't followed yet!! I was so surprised!! I could have missed out on something new and fun! I follow all 11 facebook pages too!! 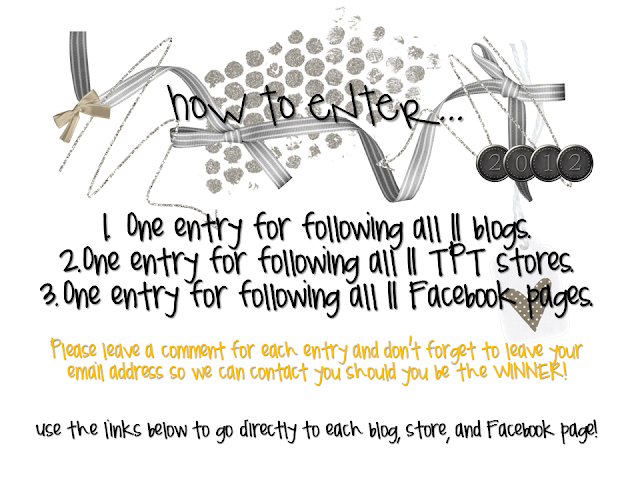 I follow all 11 blogs...great giveaway!! I follow all 11 blogs! This is an unbelievable giveaway! A great way to start the new year! I like all 11 Facebook Pages! I am following all 11 stores! I follow all 11 blogs. LOVE the all! I follow all fb pages. Does Cara have one? It says error. I'll keep trying. I follow all the tpts stores! I just found The First Grade Parade! Ok I now follow all 11 stores too! I'm fairly new to blogging and this give away and the way you orgnaized it has made it even easier to follow great blogs and stores! Thank you! I follow all 11 TPT stores. I follow all 11 on Facebook. I follow all 11 blogs!!!!! Thank you for making it so organized! I liked all 11 Facebook pages!!! I follow all 11 fabulous blogs!! I follow all 11 stores!!!! I follow all 11 stores! I "Like" all 11 FB pages. I follow all your wonderful facebook pages as well!! Thanks ladies for this wonderful giveaway!!! I follow all Facebook pages. P.S. The First Grade Parade FB link does not work. Wow! This is awesome! I follow all 11 blogs! I follow all 11 TpT stores! Love all of your ideas! I am a fan of all 11 FB pages too! I even follow some of you on Pinterest! Does that make me a Master of Stalking? I follow all of your blogs on facebook. I follow all of your stores, what fabulous ideas! Thanks for sharing!!! Such a great giveaway and a wonderful way to start the new year!! I follow all eleven Facebook pages. Thanks for all that you ladies do to inspire us to teach more creatively!! Happy New Year! I follow all of the blogs! I think it was great how you had it organized - which made it easier. I knew I followed all the blogs, but had to double check the TpT stores and Facebook pages. I follow all the stores! I follow all 11 stores. I am a fan on all the Facebook pages! I follow all 11 blogs - while being green with envy for the creativity! I follow all of these great blogs! I "like" all on Facebook. I am now a follower of all 11 blogs! I am a follower of all 11 stores...what great stuff you all offer!! I "LIKE" all 11 blogs on facebook! I follow all of the stores too! I am now a follower of all 11 fb pages! I look forward to learning a lot from all of you. I like all 11 on Facebook! Great contest! I am following all 11 blogs. I am following all 11 stores. I am following all 11 FB pages. I am following all 11 FB pages! Great giveaway! I follow all 11 blogs! I love all of the blogs. I use things form all of them. I follow all 11 amazing blogs! I am so thankful that all of you share all the inspirational things you do so I can become better at what I do! thanks! I follow all 11 Facebook pages too! I like all 11 blogs on fb. I am following all 11 blogs! I am following all 11 facebook pages! I already follow all 11 awesome blogs! I follow all 11 stores! Happy New Year! I am a follower of all 11 blogs. Thanks for doing this! I follow all 11 blogs! I love your giveaway madness right now! I follow all 11 blogs. What a fun giveaway! I am following all 11 blogs. I follow all 11 fabulous blogs! Great giveaway!!! I follow all 11 blogs! And, of course, I'm following all 11 facebook pages too! I follow all 11 blogs! Thanks! I follow all of your stores! I follow all of your fb pages! Now following all 11 TPT stores too! I now follow/like all 11 facebook pages! Following all 11 blogs...just started this blogging thing over break and LOVING it! Thanks for connecting me to 11 great blogs! Following all 11 TpT stores! Also just discovered this winter break! I am so geared up to start the second semester of school now! Following all on Facebook as well! I follow everyone on Facebook as well! I liked all 11 Facebook pages too! I follow everyone on Facebook! I'm following all 11 stores. I'm following all 11 Facebook pages. I am following all 11 blogs! Thanks for this wonderful opportunity! I follow all 11 blogs via RSS! I also follow all 11 stores! Some great resources - thank you so much for sharing your creativity! I follow all 11 blogs and have been so excited about the lessons I am planning! Thank you to all of you!! I follow all ya'll's blogs! Wow I've never said that or put two apostrophes in one word! ha! I am a fan of all 11 FB pages too. I Liked all 11 Facebook pages. I've joined all of the blogs as a follower. I follow all 11 stores as well. Okay, I have never entered one of these giveaways before so I hope I am doing this right. I am now following all 11 blogs. I follow all 11 FB pages! I am new to blogs and am amazed at the amount of fantastic work there is here! I am a new follower to you all and soooooo excited! I am following all TPT stores. I like all FB pages! I follow all these TPT stores! They are fantastic!!! I follow all of the blogs and I love em! !